Sciatica nerve pain travels along the sciatica nerve. The definition of sciatica is the pain that travels along the sciatic nerve that branches from the lower back, hips, buttocks and down each leg. Sciatica nerve pain can affect just one side of the body. This nerve is the largest in the human body that runs vertically down the back of the thigh all the way to the feet. The cause of sciatica stems from a herniated disc, spinal stenosis (narrowing of the spine/compressing part of the nerve) or a bone spur on the spine. This injury can create leg pain, inflammation, and numbness. Pressure from twisting and bending, heavy lifting, bad posture, pregnancy, and other conditions can place a strain on the discs. Other causes include a pinched nerve and even arthritis. Besides injury, other contributing factors putting someone at risk include everything from age, health, occupation and even diabetes. The latter impacts the way the body uses blood sugar thereby increasing nerve damage. A herniated disc or bone spurs are a higher risk that comes with age and this condition is the most common cause. Obesity increases the stress on the spine and contributes as a sciatic trigger. An occupation that requires heavy lifting, twisting the back or sitting for extended periods of time can assist in the creation of the painful condition. Lack of movement can also attribute to the risk so prolonged periods of sitting are to be avoided. Once injured, the pain radiates from the lumbar region, traveling the buttock and down the back of the leg. This pain can feel like a mild ache all the way to a sharp stabbing and even burning excruciating pain. The affected person can also feel numbness, weak muscle(s) and tingling (pins and needles sensation) in the leg or foot. An exam check by a sports medicine doctor can show muscle strength and reflexes. The patient may be asked to walk on their toes or heels or to rise from a squatting position. They may also be called upon to lift the legs one at a time while lying on their back. During this exam of activities, sciatic pain usually worsens. What are the treatments for sciatica nerve pain? Most sciatic nerve pain resolves itself without requiring medical attention. However, if the pain does not abate permanent nerve damage can occur. It is important to get sports injury treatment if you are experiencing hip pain or loss of feeling in the leg. 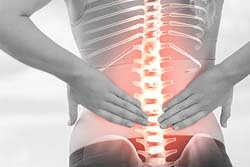 Chiropractic adjustment or spinal manipulation is one form of therapy a chiropractor uses to treat sciatica. Treatments can also include using hot and cold packs on the affected areas. Cold packs can provide temporary relief. Alternating cold and hot packs are another methods used to alleviate hip and leg pain. Over-the-counter pain relief from medications such as ibuprofen and naproxen sodium can reduce inflammation and provide temporary respite from sciatica pain. There are a few preventative measures one can take to reduce the risk of sciatica nerve pain. Regular exercise and getting the back muscles strong, paying close attention to core muscles in the abdomen and lower back can help. Maintain proper posture when sitting and have a good chair that supports the back. Proper techniques should be used to avoid twisting the back when weight lifting to prevent sciatica nerve pain and other sports injuries. Use handling aids whenever possible. Keep your head up, shoulders level and in the same direction as your hips. Do not straighten the legs before lifting or strain the back as you rise. Always ask for help instead of lifting a heavy load alone. It’s not always preventable but doesn’t invite injury to visit you. If you do happen to experience sciatica sports medicine may be a great drug-free option for natural healing.